During the past couple years I have corresponded with Frank Purcell, a retired Chemical Engineer. Frank has written that he holds a Masters of Science in Chemical Engineering, a Masters in Control Systems Engineering and a Bachelors in Computer Science. The article was written by Alejandro Rojas and explored the work of Frank Kimbler, a teacher in Roswell. It seems Kimbler found some debris, suspected it may be from the famous crash, and subsequently had the debris analyzed. The chart below, taken from the article, plots the ratio of isotopes Mg26/Mg24 vertically against the ratio of isotopes Mg25/Mg24 on the horizontal axis. The sample of metal analyzed from Roswell is shown by AH-1 that is clearly not on the line of the other samples. 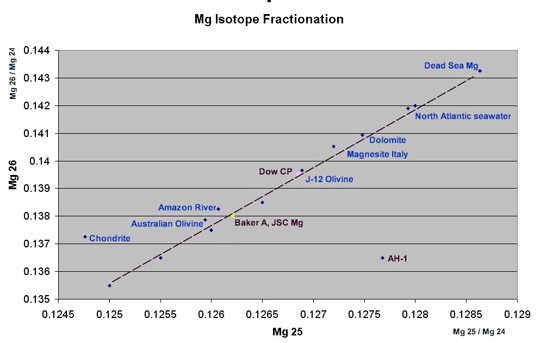 The line represents the spread of Mg26 relative to Mg25, the two minor isotopes, each nominally 10% compared to the more abundant isotope MG24 that is roughly 80% of earthly magnesium. The data is presented and plotted as isotopic ratios. Although AH-1 is shown as a point, it is really an area on the chart extending from 0.120 to 0.135 on the horizontal axis and from 0.125 to 0.140 on the vertical axis. (These ranges are calculated from the observed data.) It is clear that this range does in fact intersect the line and is suggestive that the AH-1 sample is not extraterrestrial. Sure, additional measurements would be helpful to discern if the metal is terrestrial, or not. Hopefully, Open Minds will publish additional results when they are available. I would also like to see Open Minds or others follow up on the Kimbler debris, eventually giving us the rest of the story. One way or the other, I appreciate Frank offering qualified peer review. Ufology could use more of this kind of analysis of such circumstances and those who report them. Ever skeptical Lance Moody seems to have hit one over the proverbial fence with his recent investigation of ufologist Philip Imbrogno. Well, that might now be former ufologist Imbrogno, thanks to some clever and good work by Moody. In his blog What the Hell Was That?, Moody explained how he discovered Imbrogno's alleged credentials could not be verified. Neither could Imbrogno's alleged Special Forces duty. Enter Decker, of Paracast forum, and the jig was up. Imbrogno now has a whole lot of explaining to do. Very nice work, guys. Source A was an anonymous alleged insider presented and assessed authentic by certain moderators at Open Minds Forum. Murnut, Zep Tepi (of Reality Uncovered forum) and a few select others were not as willing as many to blindly jump on the bandwagon. Imagine that. An investigative team assembled, and Source A was ultimately irrefutably demonstrated to be a fraudulent hoaxer. Excellent work, team murnut. Some Source A loyalists refused to revise their supportive opinions, in spite of all factual evidence presented to the contrary. Certain members and personnel of Open Minds continue to remain close minded to the facts. Oh, the irony. DrDil of UFO Casebook forum is a virtual PhD on the drones fiasco, a series of alleged sightings with more contradictions and loose ends than the Casey Anthony trial. DrDil contributes to related discussion threads, set up a website exclusively devoted to his drone research, maintains a blog, and covers aspects of the case ranging from photo discrepancies to the questionable inconsistencies in the reporting done by Linda Moulton Howe. Stiver of UFOmania forum once took an interest in the Chris Bledsoe, Sr. case of alleged alien abduction. Among other curiosities, Stiver noticed Bledsoe's artistic abilities took an inexplicably abrupt and intermittent spike for the better. Stiver conducted a little detective work and determined the alleged Bledsoe sketch – the high quality drawing of an alien – was in actuality an enhanced reproduction (traced, basically) from a famous image of a crop circle. To add insult to injury, there was talk that Bledsoe's profoundly increased ability to draw could be attributed to his encounter with aliens. I don't know about artistic ability, but these alien encounters don't seem to do much to help people tell the truth. Enigmatic James Carrion ranges from disappointingly silent to very refreshingly outspoken. The former MUFON International Director's areas of interest and topics of discussion have included, among many, the likelihood the Cold War gave birth to the modern UFO myth, the CIA manipulation of MUFON, and the inconsistencies in the accounts of self-described extraterrestrial contactee Stan Romanek. Among other Romanek inconsistencies, Carrion wrote about multiple reports filed in connection to the Romanek case, allegedly filed by different witnesses, yet many of which contained the same misspelling of the word 'follow,' incorrectly spelled 'fallow.' Curious indeed. Carrion's interesting blog, Follow the Magic Thread, additionally includes descriptions of how he came to develop realizations of the ineffectiveness of MUFON investigators, suggesting they do not ask the right questions. Carrion further suggested his MUFON stint led him to realize there is an overwhelming lack of evidence of an ET presence, considering that of the thousands of cases logged in the MUFON system, absolutely none provide a smoking gun. Carrion implied if an individual or organization investigated mountains of cases and none of them provided direct evidence of aliens, then the popular explanation should not be the ETH. Imagine such a thing. Carrion's wild west style of shooting from the hip has been appreciated in the past and, as Stiver recently commented, would be greatly appreciated at least once more – about the Ambient Monitoring Project. If there is anyone the UFO community might ever be able to count on for an honest and accurate description of what took place during the AMP, helping us curb the intelligence-insulting excuses and evasion of the real issues, it would be Carrion. If there is anyone equipped with both the first hand knowledge of the situation and the guts to lead the hunting party, it would be Carrion. Anyone up for a hunting trip? Kentaro Mori operates a site, forgetomori.com, that states, “Extraordinary claims. Ordinary investigations,” and indeed delivers practical, quality material on many aspects of the strange. From alleged stick figure aliens to supposed time travelers, Mori provides objective evaluation and cites sources. Imagine that. Some of Mori's best work was on the UFO videos out of Turkey, which brings us to elevenaugust, who does some great film analysis, among other things. Elevenaugust can be found on the usual UFO forum haunts, contributing quality posts about topics such as the Turkish videos. He also kept us updated on the alleged zombie photographed crawling around the woods in Louisiana. I can't write that with a straight face, but 11a's posts were truly interesting reads on the matter. Could You Swab That Deck for DNA While You're Stacking It? Last but most certainly not least are the women who confirmed that abductology leaves a great deal to be desired in the way of honesty and objectivity. Thank you, Emma Woods and Carol Rainey, for your informative and important work. Woods and Rainey courageously published their accounts of David Jacobs' and Budd Hopkins' biased distortions of truth and lack of professionalism, including a Rainey film in which Hopkins blatantly stated he is attempting to stack the deck. Many of us long suspected such dishonesty and subjective reporting to be the case, and Dr. Tyler Kokjohn put a professionally qualified voice to our concerns when he began to write about the manner in which such 'researchers' were consistently missing valuable opportunities to collect samples of alien DNA. That was the case, anyway, if we were to believe virtually anything they told us was true. We are not only still waiting for the DNA evidence, but we also continue to await explanations as to why such evidence has not been presented. Woods and Rainey continue to speak out on the issues in spite of being repeatedly mistreated in many social situations, including experiencing direct negative consequences in certain circles and being censored and banned on select websites. I appreciate Woods' and Rainey's work. Additional thanks to the Paratopia team, Gary Haden, Doug Mesner and all the rest of the 'netters who support efforts of people such as Woods and Rainey to set the records straight. There are at least two ways to address the case of Miami orbs and MUFON games. One perspective is the reasonably interesting reported events experienced by the apparent witnesses, and a second is a chain of events that occurred during the investigation and involved UFOmania forum, at least to some extent and as described by then-MUFON personnel Larry Gessner and Morgan Beall. As I explain, it will become apparent why I, a UFOmania forum moderator, and stiver/Iza, the UFOmania forum administrator, were left shaking our heads about the chain of events. At a MUFON meeting conducted in St. Petersburg, Florida, on Saturday, February 26, 2011, Morgan Beall reported a man and his wife witnessed a sphere-like object at their home in Homestead, Florida (Miami-Dade). This particular sighting reportedly occurred around the turn of the year, but the couple and at least one other family member allegedly had somewhat of a history of sightings in addition to the latest event. One such sighting was a recent event in which a football shaped and sized object, pulsing red, was apparently observed and photographed. According to Beall, the object was described as hovering about three feet off the ground in the front yard of the couple's home before flying away. Beall shared related photos and their analysis. The case included military or intelligence implications, as Beall reported the family had ties to law enforcement and military service. Actually, to an extent that Beall stated were quite significant. Additionally, their residence was near a major military facility. On February 12, Beall made a post on the UFOmania forum in which he requested information about the Miami-Dade sighting. Shortly thereafter, on February 14, Larry Gessner contacted Iza and directly stated the UFOmania forum was involved in a MUFON investigation. Gessner requested Iza's help with said investigation. Gessner informed Iza two unknown individuals had somehow gained what he termed restricted information about a case. Gessner further stated the two individuals claimed to be conducting an investigation on behalf of UFOmania, which Iza informed Gessner was a fraudulent claim. Gessner stressed the need for secrecy about the matter, for whatever reasons, and apparently highly prioritized finding out who the individuals were so it could be determined how they gained access to the restricted information. Iza requested to be put in contact with the lead investigator of the case if she was to try to be of assistance. Gessner complied, and the lead investigator was Beall. The case turned out to be the Miami-Dade sphere sighting. During the previously referenced February 26 MUFON meeting, Beall proceeded to publicly discuss everything and much more that Gessner had emphasized was so secret and should be held in such confidentiality. As Iza had learned by this point in time through her correspondence with Beall, two individuals claiming to represent UFOmania had visited the home of the couple. The two were denied access to viewing the area in which a sighting occurred, yet returned later and entered the property without permission. The homeowner was seemingly very angry about the trespassing and apparent security breech that appeared to be the responsibility of MUFON's lack of ability to keep personal information confidential. According to Beall, the couple apparently had other uninvited visitors as well. It has been speculated by MUFON personnel that these visiting parties may have been from a government agency or may somehow have been related to ufology entrepreneur Robert Bigelow. Current and former MUFON personnel have now made public statements in which they proclaim direct government interference in the investigation. It is noteworthy this was a STAR investigation, at least on behalf of MUFON, and security issues are by no means new to the division. Such information leaks have occurred before. I do not know how the deceptive visitors in question initially got the personal information of the couple/witnesses, enabling them to locate their home. Neither do I know why Gessner and Beall had such conflicting stances on secrecy and how to conduct their affairs. Lastly, I do not know exactly why the alleged visitors would choose to claim they are representing UFOmania forum when Iza and I have no knowledge whatsoever of them or their activities.